No need to preheat! The BLACK + DECKER™ 6-Slice Toaster Oven features enhanced convection technology that circulates hot air to cook all your favorite frozen snacks and pizzas in no time. 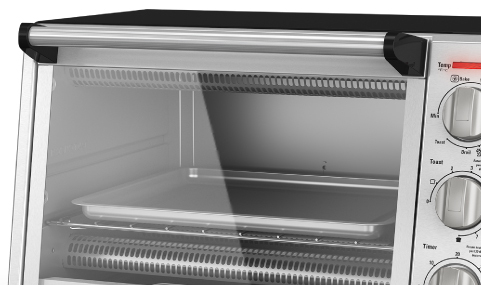 Plus, the interior of the oven is designed to focus heat towards food for fast and even cooking. With four cooking functions (bake, broil, toast, and keep warm), and room for a 9” pizza or six slices of bread, this toaster oven makes mealtime easy. Hot air is circulated inside the oven for fast and even cooking. 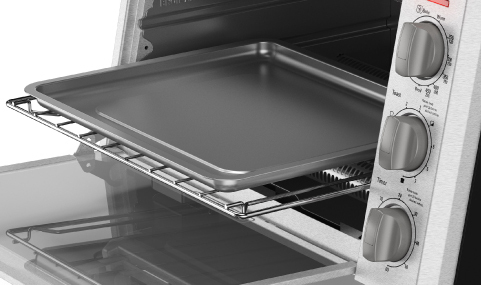 Choose from convection bake, broil, toast and keep warm. Easily fir a 9" pizza, six slices of bread, or a variety of other snacks and meals. The 60-minute precision timer includes a stay-on function for longer cooking tasks, and the dedicated toast timer finds the right shade. 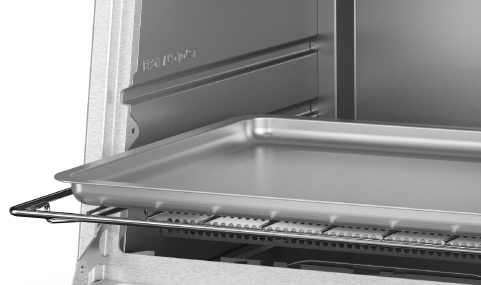 Added versatility for cooking under the broiler or to fit larger items. Keep a close watch on your food while it bakes without opening the oven door. The included broil rack and bake pan fit perfectly in the toaster oven. 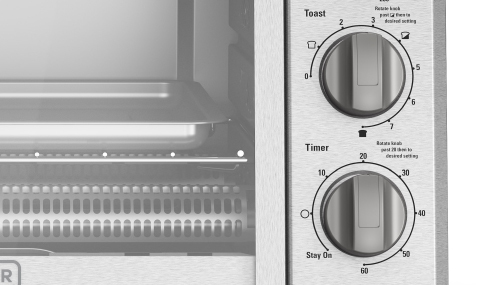 6-Slice Toaster Oven is rated 4.7 out of 5 by 14. Rated 5 out of 5 by Eevee from Great Toaster Oven! Really loved this toaster oven! Simple to use, thorough cooking, and many different heating options. I also loved that it allowed me to do away with my regular toaster! Rated 4 out of 5 by trice125 from Good Toaster Oven This toaster oven really comes in handy when you don’t want to heat up the whole house to cook something. Cooks evenly and quickly. It’s also great when cooking for a few people. Rated 5 out of 5 by Lori1313 from Great for cooking anything! So far I have tried to cook quite a few things in this toaster oven, and it cooked everything perfectly! It is so easy to use and solidly built - feels like it will last a long time. It gave a nice crisp to appetizers that I never get from the oven or microwave. I even tried a small batch of cookies - they were done faster, cooked more evenly, and looked better. The only thing I would change is to make the temp knob a little more detailed and show more numbers. I use this almost daily and highly recommend it. Rated 4 out of 5 by MaryL from This oven bakes, broils and toasts, without having to preheat. Toast turned out nice, and this oven cooks evenly. Not as spacious as it says it is, but to me that's not as big a deal. Also great for reheating things. 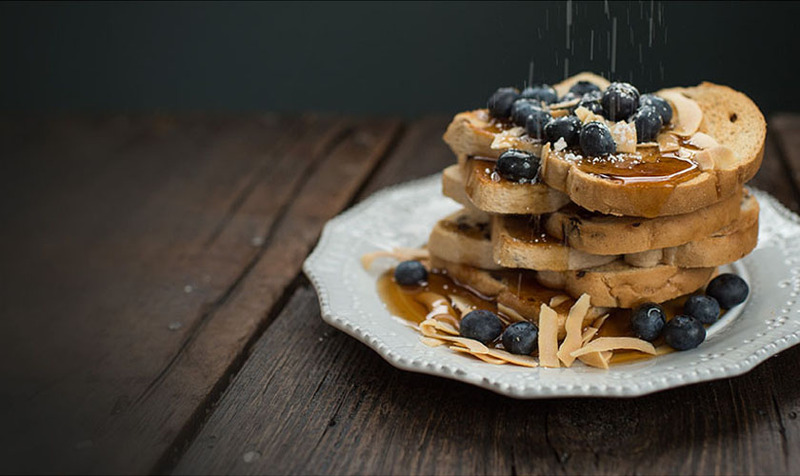 Rated 5 out of 5 by Jillybeans06 from Awesome! Loved this! So glad I got to try it. It's really easy to use and the cleanup was extremely easy the trays slide right out. It also heats up pretty fast. It's definitely come in handy quite a few times. The only minor flaw I've seen is that the cord is pretty short but I think that's standard. What are oven dimensions on outside and inside? We bought the TO2055S a couple months back and found the metal strip behind the handle gets hot enough to burn the back of your fingers when you open the door. We applied the fuzzy half of high temp velcro on this; works so far. Other fixes possible?